Have you always wanted a Shell or Stone Driveway or need to refresh your existing one? 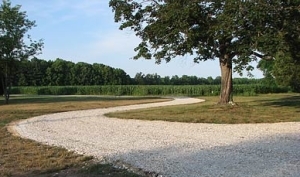 A properly designed and constructed driveway will add charm, utility and value to any home or office. Call A to Z Treez and we'll make your vision a reality. Choose from materials such as clamshells, bluestone or nativestone. First we dig out your new driveway. Next we put down a T base which is a crushed asphalt, sand and concrete mixture used to harden the base of the driveway. And last we install the materials of your choice.